"Hey Jason, your tips have really helped me become a better computer user. Thank you." "Thanks for the great info - I am learning so much about my PC I never knew." "My son recommended your newsletter, and it's been very helpful so far!" * We don't rent, sell, or spam your email address! 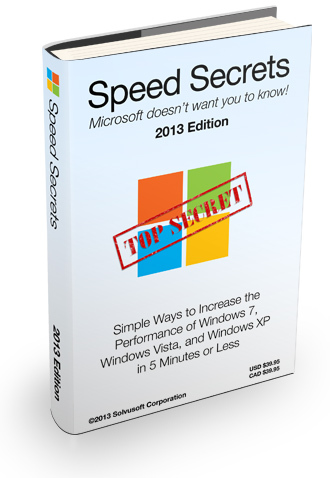 When you subscribe to our FREE Secrets of Windows newsletter, you'll receive Speed Secrets ($39.95 value), an easy-to-follow Windows tips & tricks guide, absolutely free. Sign-up to our newsletter below and get your free eBook now! These easy-to-follow tips are used by PC techs who charge you $100s to do the same things you can do yourself in minutes. You'll learn how to speed up your computer instantly without spending any money on upgrades or software! The 2-click display change that will allow you to surf the web much faster! These tips provide INSTANT results that ANYONE can do... without paying some computer geek! Each "tip" has easy-to-follow, step-by-step instructions for users with Windows 7, Windows Vista, and Windows XP. Plus, as a subscriber to our newsletter, you'll receive a weekly Windows tip delivered directly to your email box, along with discounts of up to 75% off the latest software. Enter your name and email address in the grey box to the left and get your free eBook now!